NEW DELHI — India says it has successfully test-fired an anti-satellite weapon in an unexpected announcement just weeks before a general election. 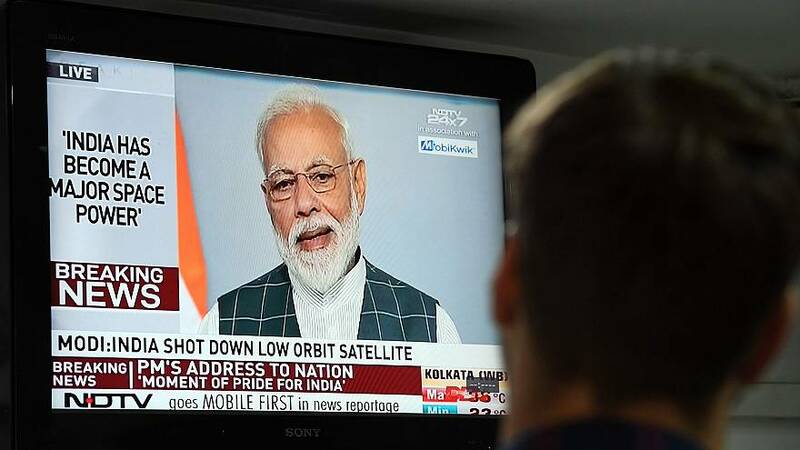 Prime Minister Narendra Modi said in an address broadcast live Wednesday that Indian scientists had earlier destroyed a low earth orbit satellite with a missile, demonstrating India's capacity alongside the U.S., Russia and China. "India has made an unprecedented achievement today," he said, speaking in Hindi. "India registered its name as a space power." The announcement is Modi's latest bid to flex India's military muscle as his party seeks to retain power in polls beginning April 11. Brahma Chellaney, a security expert at New Delhi's Centre of Policy Research, told Reuters that the U.S., Russia and China were also pursuing anti-satellite (ASAT) weapons. "Space is being turned into a battlefront, making counter-space capabilities critical. In this light, India's successful 'kill' with an ASAT weapon is significant," he said. China has yet to respond to Modi's announcement. Old rival Pakistan, which has felt rising tensions with India recently, did not immediately comment either. In February, India said it had launched a "surgical strike" on a terrorist camp in Pakistan after 40 Indian soldiers were killed in a suicide bombing in disputed Kashmir. Afterward in an air skirmish, Pakistan shot down one of India's Soviet-era fighter jets, prompting scrutiny of India's aging military hardware.